McHenry County Youngsters have always found a way to keep busy when not in school or doing homework. Video games are played today. Sit down, stare at a little digital screen, and push buttons to be entertained by all sorts of stuff. What did kids do before video games became so popular? Watching TV has been around for many years. Listening to The Lone Ranger, Superman, and Bobby Benson and the B-Bar-B Riders, was a daily ritual during the days of radio. “Stick-ball,” “hide-and-seek,” and “simple simon,” were neighborhood games played by many. Little League Baseball and other organized sports have been around for a long time and are still active. How about car racing for kids? That may not seem appropriate, but it is a kids sport that started many years ago and remains popular to this day. It all began in 1933 in Dayton, Ohio. Journalist Myron Scott spotted three boys racing down a hill. The boys had built small cars out of wooden boxes and baby-buggy wheels. The journalist sponsored a race for the boys and their friends the next week. A trophy was awarded to the winner. Nineteen youngsters showed up for the race. The race spark was ignited. The Mr. Scott found sponsors, spread the word, and the first national Soap Box Derby race was held in Dayton, Ohio on August 19, 1934. The interest in young people racing homemade cars grew rapidly. Generous sponsors helped the program grow and in 1935 the federal Works Progress Administration built a large soap box derby facility in Akron, Ohio. The national soap box derby race has been held in Akron every year except during the years of World War II. The 70th anniversary race was at Akron on July 21, 2007. 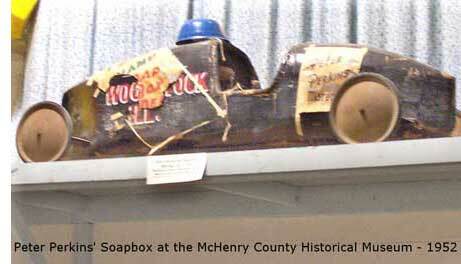 McHenry County has been involved in the All American Soap Box Derby (AASBD) program almost since it was started. County resident Mr. Henry E. Buch built a car and entered it in the soap box derby race down the South Street hill in Woodstock in 1940. He didn’t do well in that race, but he did very well the next year. 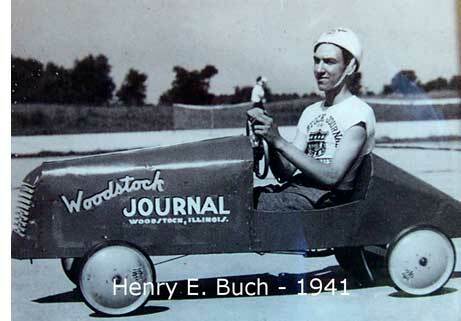 Mr. Buch was fifteen years old in 1941 when he won local races and was sent to the national race in Akron, Ohio. Mr. Buch was a B-29 crew member during World War II and later became a prominent citizen in McHenry County. He opened the 2005 Soap Box Derby races in McHenry, Illinois with a ceremonial run down the track in his 1941 car. The rubber on the old wheels gave out near the end of the track and he crashed. He was not hurt, his car was repaired, and he still has it. During the 1940s informal soap box races were held weekly at numerous towns in the Fox River Valley. Eventually, Woodstock became the official site for the AASBD race at the local level. Mr. Don Peasley was the Derby Manager for the official 1951 Woodstock race. Mr. Peasley is currently a prominent photographer/journalist in McHenry County. Soap box racers in Woodstock started near the high school and raced their cars down the South Street hill toward town. Jim Barrett built a car, raced it in the 1952 Woodstock race, and was one of the winners. Mr. Peter Perkins of Marengo also entered that race. His car placed well enough to be sent to the races in Akron, Ohio. Is there an alternative to video games for youngsters today? Sure! The soap box derby is active and popular in McHenry County. The town of McHenry is where the official race is held each year. The track goes down the hill toward East Campus High School. The McHenry Kiwanis Club is the sponsor of this exciting event. The rules are strict. Cars must be built with adult supervision. Cars are built from a kit and can be purchased locally. Boys and girls from ages eight to seventeen can become soap box derby racers. There are other requirements that must be met. The rewards are great. Building the car and being in a local race is exciting and something just a bit unusual. A local race winner can enter a regional “rally” race. Rally race winners are the ones who take their cars to the national race in Akron, Ohio. Racers who win or place in each division at the races in Akron receive very nice scholarships.